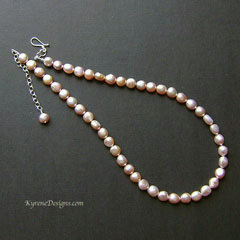 Pretty baroque pearl necklace in a lovely shade of natural cool-toned pink. These lustrous plump baroques are popular for contemporary pearl jewellery. Matching earrings and bracelet available. A great way to introduce yourself to pink pearls which go wonderfully with outfits in those plum, grey, brown, navy colours. Length 17 inches (43cm). Pearl 9mm. With easy to use sterling silver hook clasp, plus 2" sterling extender. Strung on flexible jeweller's wire. 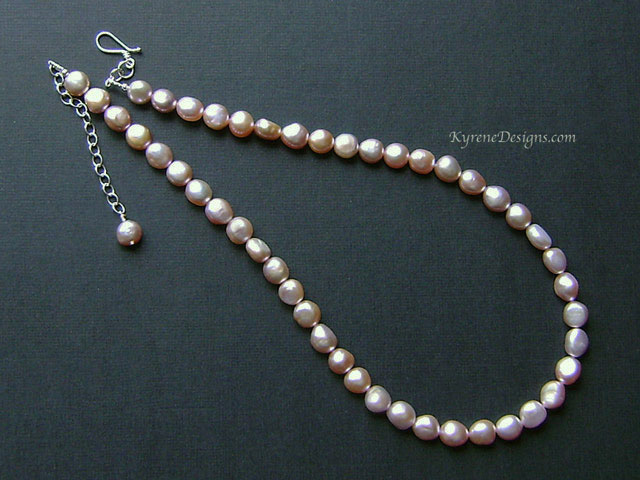 View our materials page for information on natural freshwater pearls which vary slightly.